A lifetime of fitness in just minutes a day. I don't have time . . . I'm too tired . . . I hate gyms . . . These are among the most common excuses for not exercising. But the truth is that getting in shape requires less time and effort than you might think. Examining everything from pre-workout stretches to post-workout protein shakes, this science-backed book slices through fitness fads and misconceptions to reveal how you can exercise quickly and effectively. For example, is it best to exercise in the morning? Does aerobic activity burn more fat than weight lifting? You'll also learn how to get and stay motivated, what equipment to buy (and what not to waste money on), which dietary supplements really help, and how to combat muscle soreness. 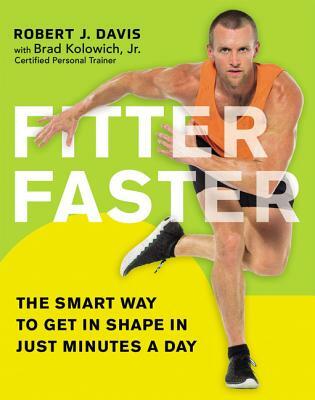 Fitter Faster explains how to: Find the right balance between cardio, strength, and stretching * Slash workout times with high-intensity interval training * Prevent boredom * Enhance fat-burning The accompanying Fitter Faster Plan, developed with celebrity trainer Brad Kolowich, Jr., pulls everything together. Requiring as little as 15 minutes a day, these quick workouts maximize efficiency-allowing you to reap the greatest benefit in the shortest possible time...all without ever having to set foot in a gym. With photographs illustrating each exercise routine, this eye-opening book will forever change the way you work out- and help you get fitter faster. Robert J. Davis, Ph.D., is an award-winning health journalist whose work has appeared on CNN, PBS, WebMD, The Huffington Post, and in The Wall Street Journal. The president of Everwell, he hosts their myth-busting "Healthy Skeptic" videos, viewed by millions each month. Brad Kolowich, Jr. is a Certified Personal Trainer whose celebrity-packed client list includes actors, athletes, and TV personalities. He has been featured in fitness magazines and recognized as one of the Best Bodies of Atlanta.